Paint trends change like the weather. Less than five years ago most buyers (and sellers) wanted neutral tones specifically light tan. Ten years ago homeowners tended to play around with pops of color all through the house, and having an accent wall was a big design trend. A blue dinning room, a red kitchen, yellow bathrooms… now those same color choices can kill a deal in real estate. 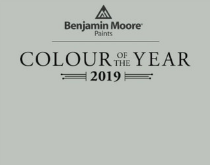 Benjamin Moore’s 2019 Color of the Year is Metropolitan. A stylish gray with cool undertones. With the recent trend of modern farmhouse decor we are seeing more and more homes painted in varying shades of white or gray. Search one of Instagram’s popular hashtags, #farmhousestyle and you will see neutral kitchens, with white, gray or greige (a combination of grey and beige) walls, counters and decor. The trend in interior design has become more and more monochromatic. In fact, pictures that feature spaces with primarily all white or neutral tones seem to get more likes and interactions than that of colorful images. Look again at trending images on Instagram and most are similar images with stark with walls and decor. Another newer trend in interior design is the color of your kitchen cabinets. Ten years ago dark cabinets were all we saw when browsing the MLS in Knoxville. Then the trend shifted to white or antique white. Now we are seeing more and more blues and grays. When preparing to sell your home in Knoxville it is important to think about the design choices you make. When we begin the listing process with our sellers we bring in a professional designer and stager to help prepare the home to be listed, but sometimes it’s more than simply moving a chair or removing a bunch of family pictures from the walls. Choosing the best paint colors for your home is important. The way the home looks in professional pictures is often what seals the deal for showings. Having brightly painted, multi color rooms may not be appealing to most buyers. But then, you don’t want hospital white walls either. Your home needs to be warm and inviting. It should feel homey and soothing. Check out our lists for the best paint colors. We recommend selecting neutral tones. If you have rooms that lack natural sunlight using a lighter paint color like Benjamin Moore Simply White, can help brighten the space. Painting interior doors can change the overall feel of the home and make it more appealing. Likewise, consider the color of your cabinets. If they’re outdated you may want to considering painting them (inexpensive products are available at Home Depot) or consult a chalk paint expert like local Back Porch Mercantile in Bearden about how to best apply this product to your kitchen. 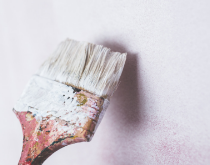 Whatever colors you choose, giving your walls a fresh coat of paint before you put it on the market is always a great idea!